Before I explain why I didn’t enjoy it, I’ll explain a bit more about the game. You play the character of an old little lady that visits the graveyard. She’s not there to mourn her deceased husband or even to visit a grave. She’s there to sit on a bench, contemplate about death and eventually even die. The sound – not only the song, but also the environmental sound of the birds and the small little noises – really sets the right atmosphere for the game. Just like the fact that (if you play the trial version) when you walk back out of the graveyard the sound becomes louder, which offers a cold shower or a wake-up call: it’s time to go back to the real world. The graphics are pretty, like I’d expect from a Tale of Tales game. They form a unity with the sound, movements and content. I like the fact that they’ve chosen to make it in black and white and that they’ve kept things simple. The only small annoyance I had was with the animation of the woman, when her eyelids moved they seemed almost alien, like they weren’t part of her body. Apart from that I love the animation of the woman and how she changes her movements when you walk along the path. When I first played the game I wanted to explore the graveyard more. 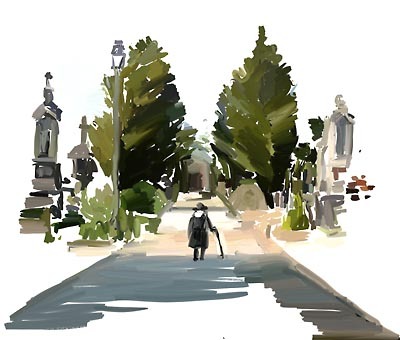 And I thought that maybe she wanted to visit a grave and went looking for one, but I soon found out that she wasn’t there for that, she just wanted to sit on the bench. Then the song (written and performed by Gerry de Mol) started and it startled me, because of the voice of the singer and simply because I wasn’t expecting a song. But during that song and while the lyrics sank in, it grabbed me and I felt extremely sad. I haven’t played it since and didn’t enjoy playing it, purely for that reason. Later I let my friend, Carla, play it and observed her. She doesn’t play games, she even considers them a waste of time and thinks I’m crazy to invest so much in them. So I thought it’d be really fun to see how she’d react to the Graveyard. The first thing Carla wanted was to run really fast and when she noticed the old lady couldn’t do that she was disappointed. Then she thought that if the old lady just rested for a while on the bench, she’d become young again and would be able to run around! It of course never happened. After the song was over, she wanted to explore the environment more and thereby activate another song. Afterwards she said the game was weird. I wasn’t surprised by this, but I could also tell that the game touched her as well. So I didn’t find this fun to play, because it made me sad. I also don’t want to play it again, since I think it’s a one time experience. Yet I do think it’s a really well designed innovative game that deserves to be a finalist at the IGF. It raises some interesting questions about games, especially concerning passivity. While I was playing I continuously had the feeling I wasn’t the old woman. In most games the avatar that you control is your representation in the gameworld, yet here I felt like I wasn’t the avatar, but someone else that guided the avatar through her journey. In the instruction of the game Tale of Tales have continuously referred to the old lady with ‘her’ instead of ‘you’, so I assume that this passivity and distance between you and the avatar is created intentionally. On The Graveyard Post Mortem Michaël and Auriea have written an extensive report on the making of this game. They have consciously chosen for a passive approach. 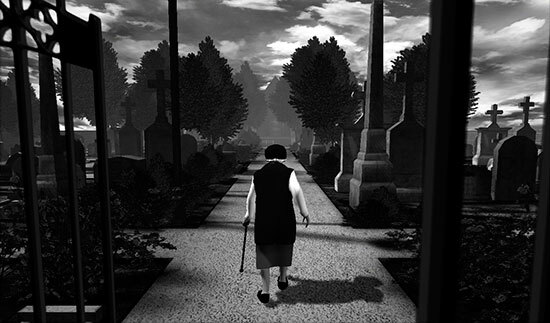 In the Graveyard you can do nothing more than steer the old lady through the gameworld and watch passively as she experiences and expresses what happens. They have designed it this way as to create a bigger emotional impact for the player. And I think they have definitely succeeded at this. This passive experience also connects with their Drama Princess Workshop in which we extensively talked about creating some kind of independent avatar. This kind of development would create a different type of avatar than we see in most games and they’ve done a good job experimenting around with this in The Graveyard. I wonder how they’ll develop this further in the Path. You Have To Burn The Rope and The Graveyard have a lot in common. They both exceed in simplicity: easy controls, a confided environment to explore within limits and a song-ending. Yet they’re worlds apart. I’m sure the other finalists for the innovation award will add some interesting questions and topics to my coverage of the IGF’s finalists. You can download and play the trial version of the Graveyard for free here. You can also pay for the full version, which adds one feature: death. For an overview of my articles on the IGF 2009 go here. I wonder if The Graveyard functions as a kind of yardstick that measures a person’s feelings about mortality. In you, The Graveyard caused sadness. But for other people it helps reconciliation. Still others are completely indifferent and untouched. Part of this is probably caused by flaws in the design, but I like to think that the artwork is still strong enough to look you in the eye and hold up a mirror. Thanks for the article. It’s very interesting. Hey Michael. I think it has very different effects on everyone who plays it. Part of the reason why it made me sad, is because I just saw a documentary about old people who were simply waiting for their deaths and this tapped into the sadness I felt for them. Of course it also related to my own personal experiences with death in my family. I think you’re right and that it does hold up a mirror and makes people think. Thanks for the reaction.